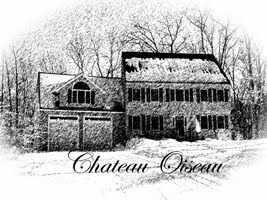 Chateau Oiseau: Finally it feels like spring! Finally it feels like spring! It has been pretty cold this spring in Massachusetts. We even had a snowstorm on April Fools day, just to throw us for a loop. But today it was beautiful--sunny and 65 degrees. It was time for a little yard work. 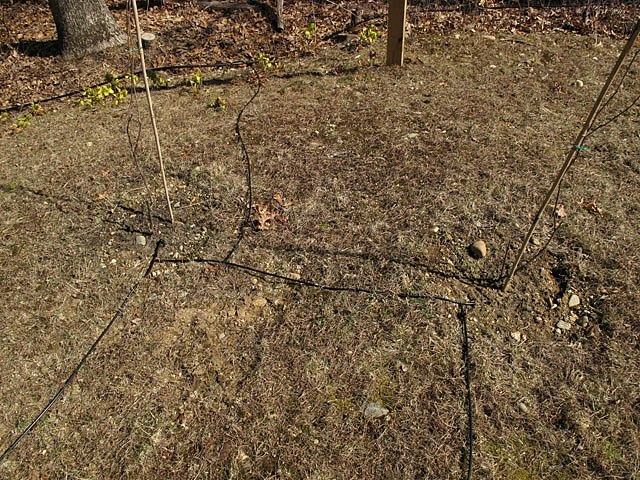 I installed my new drip irrigation system on my vines. I bought the kit from drip depot and it wasn't even very expensive. For about $150 I have a system that will automatically water the vines precisely every day to my programming specs. Each vine has a 1 gal/hour dripper on it. I will not be watering the weeds with soaker hoses. 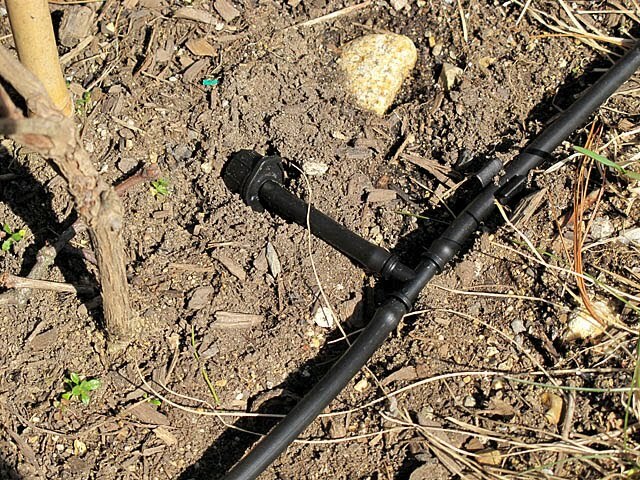 But most importantly, hopefully the vines will make better progress than they did last summer when my watering system was by hand with a hose. We went away on vacation for a week during a hot spell and one of the vines croaked. (Replacement on the way). After my new irrigation system was in, I put some composted cow manure around the bases of the vines. 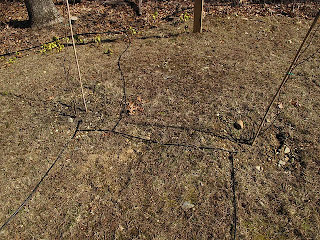 Not only will this allow good nutrients to seep into the ground, but I find that weeds do not readily grow up through the manure and it keeps the area clear most of the summer. 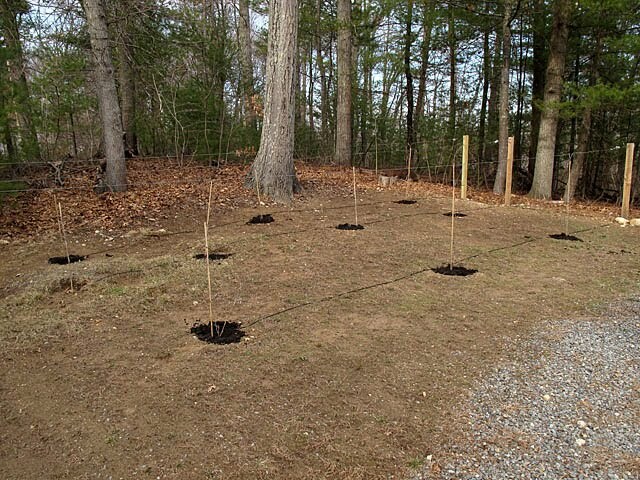 Now we just need some prolonged warm weather so these babies can start budding--and no late freezes! A few of my vines grew enough last summer that they needed pruning, so I stuck the pruned shoots into a pot with dirt in the house in a sunny window and they are already sprouting leaves. This could be the start of my nursery. 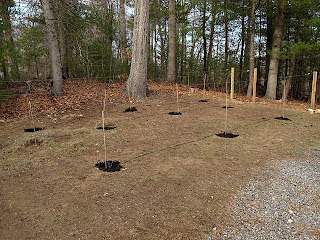 The problem is I don't have any more good places to plant any more vines with enough light, so I may be starting another vineyard at my dad's house. He doesn't know about this plan yet though. In the cellar, the 2010 spring Chilean Pinot Noir and Malbec is going to be bottled soon. It's really not that good at all. I almost considered pouring it all out--what's the point of bottling wine I don't really like? But I figured I need to practice the whole bottling thing, and who knows, in a few years maybe it will be more palatable. I'll never know if I don't bottle some of it. The 2010 fall California Pinot Noir tastes good. It didn't finish MLF so I'm going to try to get it to finish with a nutrient addition and warming it to 72 degrees. This will probably be the first wine I have made that I actually might drink. It's all about learning. I ordered my 2011 Chilean pinot noir grapes last month and they should be here around Mother's Day so I can start a new cuvée. I'm hoping that I have learned enough by now to make this batch really really good! Of course, the whole point is to become good enough at making wine that by the time I have my own grapes, I'll know what I'm doing. Looking at my sparse vineyard, I think it's going to be a while.